Spring is here and it’s the perfect time for ladybugs, so we decided to start the season off with some great hands on learning. 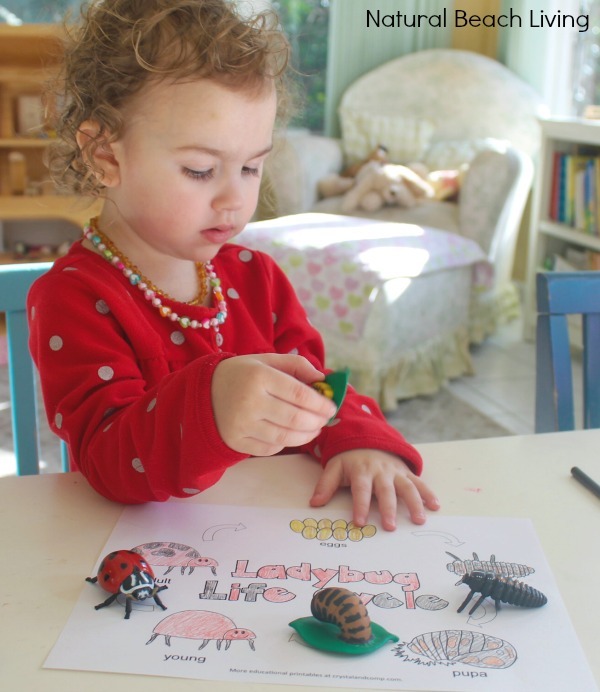 This easy ladybug life cycle sensory play and fun coloring pages make for the start of a wonderful ladybug unit study. 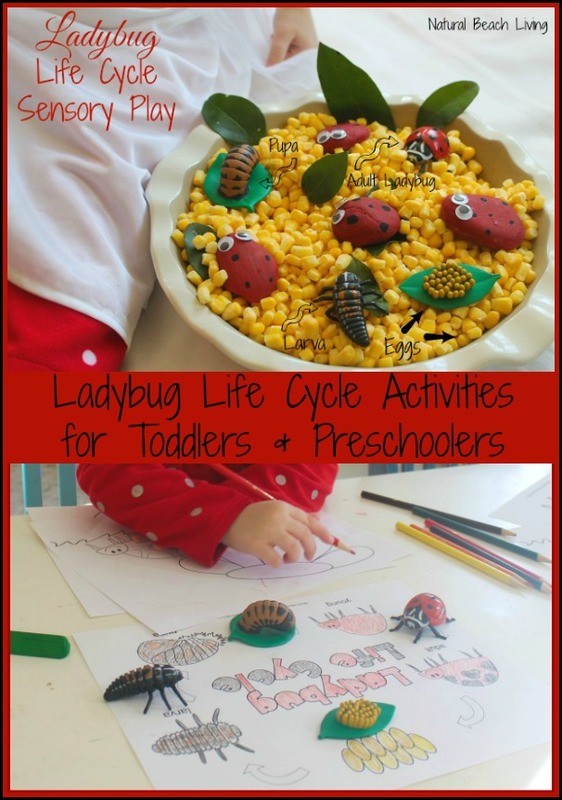 Are you ready to check out our preschool ladybug week? These ladybug life cycle figures are so great. In fact we have almost every set the kids enjoy them so much. Here is a look at how we learned the life cycle of the chicken. Each life cycle is so unique and special. Since Bells is on the younger side I knew these wonderful coloring pages would be perfect. We added in a few wonderful ladybug books. Ladybugs, Are You a Ladybug and A Ladybugs Life. Painting our soon to be ladybug rocks. 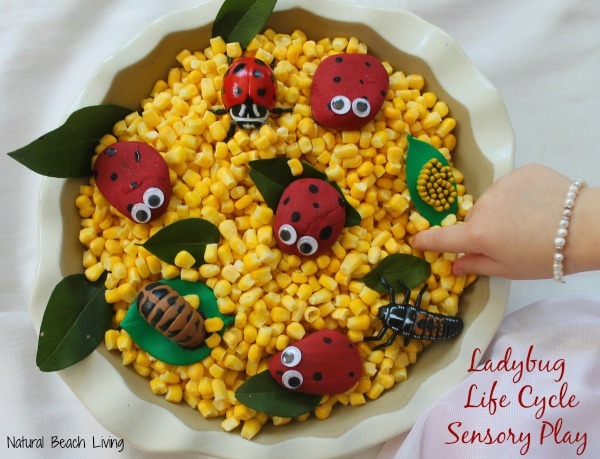 We are BIG into Sensory play here, so when I thought of ways to explore the ladybug life cycle I knew I wanted to include a sensory experience. This was the best! 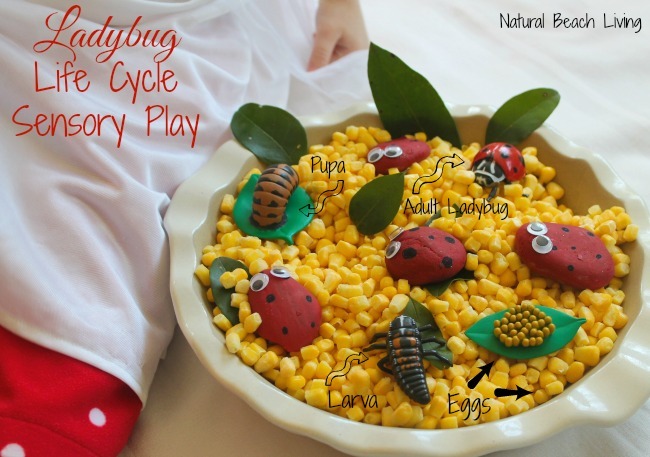 All you need is a large bag of frozen corn (those are your eggs), the ladybug life cycle set, leaves and painted rocks are optional. Viola! 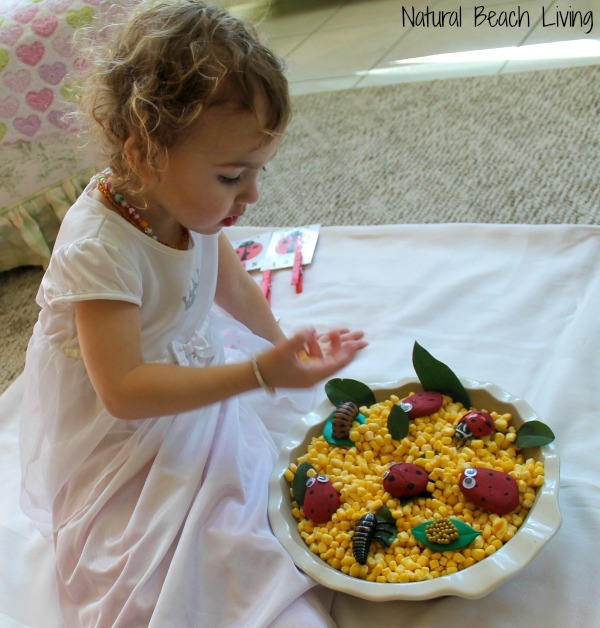 Exciting and Educational Sensory Fun! We learned that ladybugs go through several stages of growth (just like they do). We also learned that ladybugs love to eat a lot of aphids (tiny green insects). So many exciting facts about ladybugs to learn. Hands on learning and is so much fun. 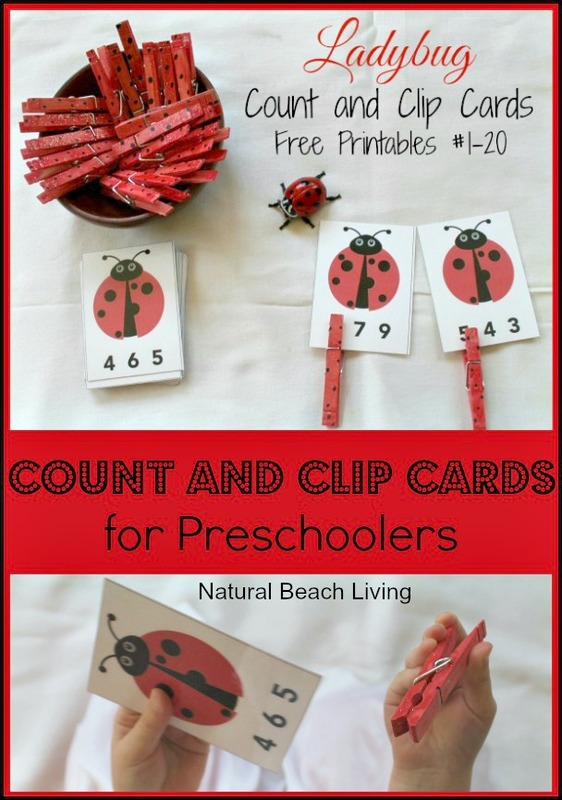 We have been enjoying ladybugs so much lately, check out these sweet count and clip cards for preschoolers. 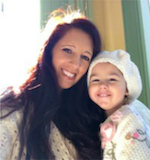 Stay connected with us while we share all of our fun learning adventures. Yeah, I enjoyed this here! 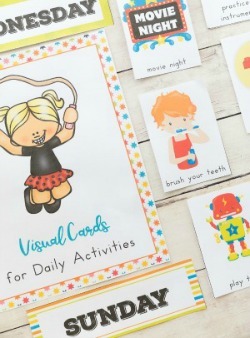 Some great ideas and I can’t wait to give those counting cards you suggested a try. I love this whole post. We raise ladybugs each year and release them into the garden, so we’ll definitely be adding in some of these great ideas this year. Thanks for the inspiration! 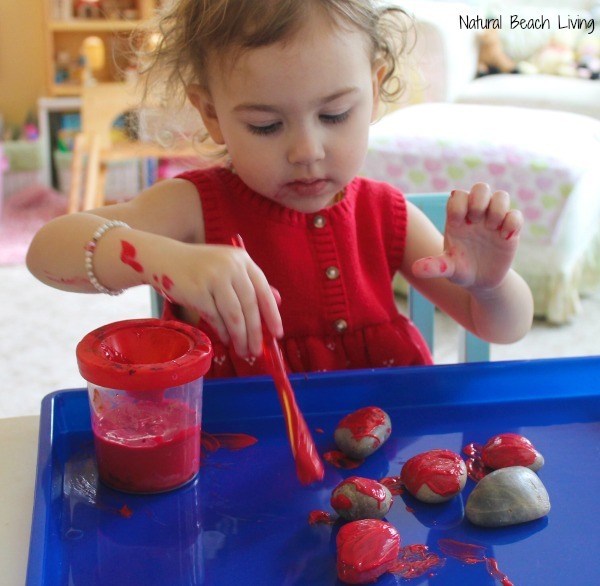 Painting the ladybug rocks looks like such messy fun! I love it!!! What a wonderful learning experience! I love the sensory part! The sensory bin is really inviting! My son would love it! I love the cute ladybug rocks! 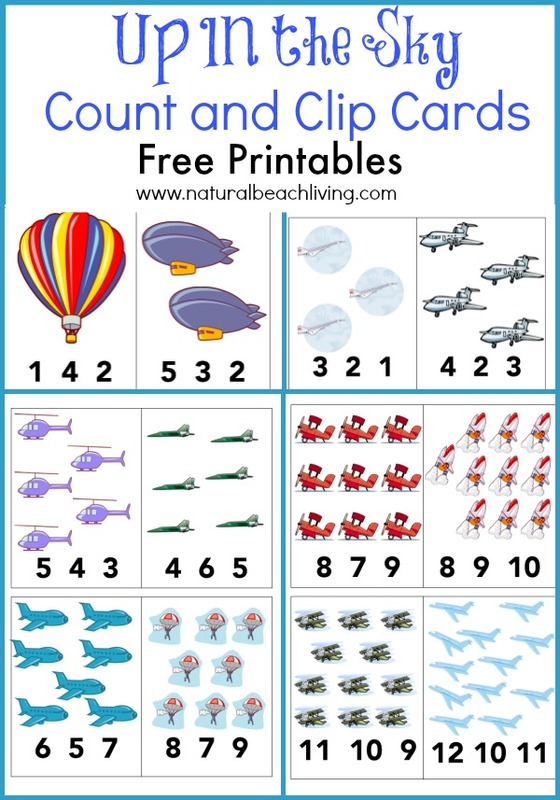 The count and clip cards are a great preschool counting activity. So fun! I love all these activities!! I’ve had my eye on those ladybug clip cards! 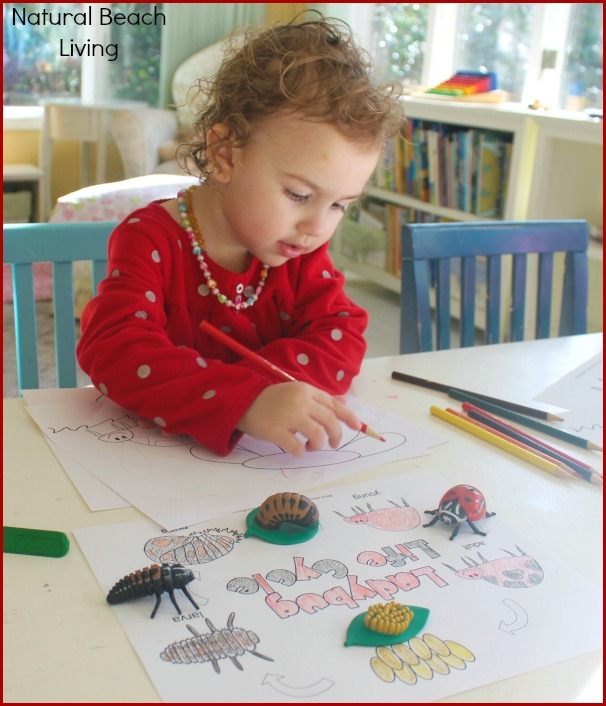 Brilliant – I love the ladybird rocks – art and sensory for science with young preschoolers is brilliant. What a fantastic art and sensory connection. We don’t have larva, but may make ours with playdough!